One Day Only, Get the Conference Room Phone You Need at the Price You Want! 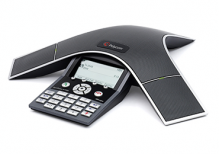 Polycom Soundstation IP7000 PoE (MSRP $1,339) only $728! Polycom Soundstation IP6000 PoE (MSRP $929) only $499! Polycom Soundstation IP5000 PoE (MSRP $599) only $324! Call Chromis Today at 602.357.8070! All orders must be placed for shipping by 5pm EST on September 10th, 2013. This offer cannot be combined with any other offer or special pricing.